Mobile Suit Gundam Wing*: Science fiction, or science fact? In the light of the recent news regarding the LDP’s plans to build an actual working Gundam**, I started thinking about our own mecha warfare capabilities. Of course, more level heads think this is just a blatant ploy by Japan’s Liberal Democrats to gin up support from the youth. *For those of you who had better things to do than watch mecha anime on the Cartoon Network in the 90s/early 00s, or better things to spend your money on than the DVDs, a big part of Gundam W focused on using human-piloted mecha as opposed to autonomous robot mecha. Also, angst and teenagers and lots of impressively animated mecha fights (which is generally enough by itself to justify watching Gundam). As far as I’m concerned, pretty much anything can be made better by judiciously applying mecha (and you do get bonus points if those mecha transform). **Which I saw last night, and instead of posting, I put it off, and now it’s olde news. This summer has really done a number on my already lackluster blogging skills. ***I say sadly, but that’s my romantic streak coming out, I think. Sure, it’s disturbing, by Treize Khushrenada makes some compelling points about the use of robots in battle. Practically, though, robots in battle are great. Less danger**** for our side is always a good thing. ****Assuming we come up with some way to stymie the inevitable robot revolution. *****Odaiba Gundam image from Wired. 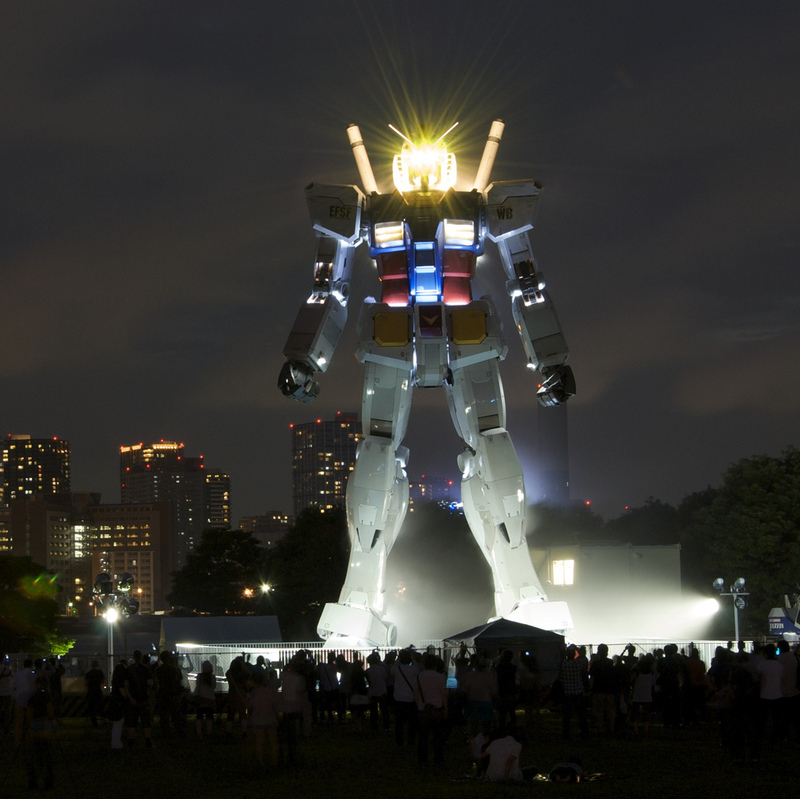 Yes, it’s an actual, life-size Gundam. No, this one isn’t functional, but IIRC the arms and head could move, and it obviously lit up. ******I don’t actually have anything to say, I just wanted to add another string of asterisks. I’ve got a few weeks worth of links coming in a tab clearing post, and hopefully I’ll be able to return to a more normal update schedule. I’ve slacked off enough.